Tencel is a cellulosic fiber regenerated from eucalyptus wood. Tencel fibers have been claimed to be more absorbent than cotton, softer than silk and cooler than linen. Standard Tencel fibers have a cut length of 38 mm. However, these fibers are available in cut lengths ranging from 12-58 mm depending on the ends use. The linear density of standard Tencel fibers ranges from 1.3-2.2 dtex. 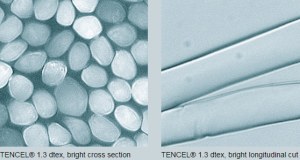 Micro Tencel may have a linear density of 0.9 dtex while some Tencel fibers used for filling or technical textile may have linear density up to 6.7 dtex. Tenacity of Tencel fibers is around 36-37 g/tex in dry state while 29-30 g/tex in wet state. Elongation at break of Tencel fibers is 14% in dry state while 16% in wet state. Tencel fibers have excellent moisture management properties. Tencel readily absorbs moisture and quickly releases it. Due to smooth fiber surface, textiles made from Tencel feel very soft to the skin. The growth of bacteria on Tencel fibers is extremely low as compared to synthetic fibers and cotton. This is because no moisture layer is developed on the fiber surface to sustain bacteria, due to quick transportation of the moisture to inside the fiber. Moisture regain of Tencel fibers is around 13%. High moisture regain prevents electrostatic charging. Tencel fibers have excellent dyeability. Tencel fabrics have good abrasion resistance and dimensional stability. Unlike wool, Tencel is not attacked by moths. Tencel fabrics crease less and are easier to iron as compared to cotton fabrics. Tencel fabrics have good drape properties. Tencel waddings offer better thermal insulation as compared to polyester fabrics.